I saw a variation of this idea and thought it would be fun to try... It is fun but, watch out, it can be messy. I used a 5"x7" canvas board a friend gave me, attached approximately 1/2 of each crayon with hot glue to one of the narrow edges of the board. For this project I used browns, greens and yellows from a 64 crayon box to simulate a field. As the melting begins with a hair dryer, the crayon can fly around so work in an area where you don't mind spots of crayon color. I melted mine by leaning it up against the side of the inside of a box. 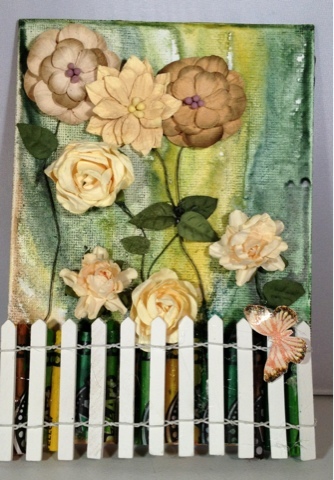 This dries quickly so I added some waxy flax stems, various flowers, leaves and a little part of a picket fence that I use with my Christmas decorations. All were adhered with hot glue. The butterfly is cut from the Pink Butterflies trim accents by DCWV. I think this will look nice in a bathroom or my granddaughter's bedroom.